Comrade Teng Xiao Ping was moving to the motorcade to see off the deligation from the banquet hall. On the way I wanted to know whether Abba would like to go to the guest house or to my place. Well Dalim, lets go to the guest house as I would like to discuss something important with you. After we finish you may take Mr. Haq to your residence. Exellency, he is my ealdest son. I know, he is a worthy son of the soil and a national hero. Since his arrival you eble son has been sincerely working relentlessly to his utmost to promote and streanthen bilateral relation between China and Bangladesh. His efforts in this regard is realy commendable. The Chinese leadership considers him to be a trustworthy friend. Exellency, you are a proud father. Gen. Zia looked a bit uneasy at such utterances of Comrade Teng Xiao Ping. My attempt to avoid any discussion with Gen. Zia did not work so, I arranged to send all the family members with Nimmi to my residence and reached to the guest house along with Abba. Dalim, could we forget and forgive and start afresh? Sir, politics is some what like a game of chess. In this game one gets enough time to think before making a move but once the mone is given then that can’t be taken back. 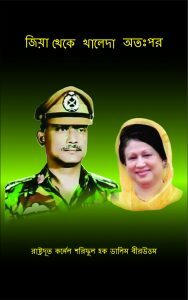 During the liberation war we took a solemn oath on clearly defined, ideals, principles amd aim to implement the true spirit of liberation war into a reality in newly independent Bangladesh through taking uncompromising revolutionary steps and thus taking all the risk we had taken the initiative and successfully organized Sena Parishad covertly. You were accepted as the cental figure uninamously and protecting you through many hazardous ups and downs we finally succeeded to bring you at the centre of power by staging two revolutionary uprisings that of 15th August and 3ed November. But surprisingly soon after you were installed at the helm of the affaires you decided to trod a different path! We became unwanted elements. You can’t ever make us responsible for this in any way. Because, we all are still living in forced exile charashing that aim, ideals and dream close to our hearts. You promised to allow Col. Faruk to do open politics but when he returned to the country you sent him behind the bars unjustly. We all submitted our resignations in protest but you did not accept. There after in a unimaginable way you duddenly decided to revove all of us and place our services with the Ministry of Foreign Affaires parmanently. These are history now. I have told you before that your compromising with India and the anti national vested interested cotaries who are lakys of foreign powers and the political forces, parties representing them you have decided to move ahead chartering a dangerous path of power struggle which would do no good to the country and the nation rather the country gradually would be heading towards unprotected sovereignity in every respect in other words, loss of it’s hard earned independence. In this process your personal fate might become horrendous. A torn piece of cloth can’t be used for long stitching here and there. More over whatever you have been doing single handedly so far, if that is bearing any positive result then all credits must go to you alone as we have nothing to do with that. Similarly, if your activities had been negative then again it is you alone who has to shoulder all the consequences and in that case reasonably I can say that we would be having nothing to share with you. In view of this realitiy and knowing everything there is hardly any scope to forget and forgive everything that you had done in the past and start aftresh Sir. I hope you are understanding the inner meaning of what I am saying. Besides, our streanth has been annihilated in a deliberate and planned way. In this back drop I don’t think a few crippled people like us could be of any use to you. Therefore, to be honest you have really surprised me with your proposal. More over, it would not be ever possible to stand beside you stepping on the blood of our martyred co-fighters. It should not be too difficult for you to understand what I am trying to convey. You know each one of us very well. In anticipation that you are aware of the fact that there is no difference in our words and deedsm I had taken the liberty to say what all I said. Gen. Zia the then apparently the most powerful man in the helm of affaires in Bangladesh was listning every word of mine very attentively with a grim face. He remained silent and speechless all through. But, I sicerely requested you all to rectify my past mistakes and work togather. Your generosity is not questionable Sir. But the fatal mistakes that you have made and the advisors who had prevailed on you to do those mistakes can’t be redressed by a few individuals with out arms and shields. You have to find out some people out of 8 Croes countrymen who has money and musscle power. It wouldn’t be too difficult. You have by now already managed to get some people of that kind. Lot many are still humming around you like bees. Sir, ordinary folks might not be knowing but you know certainly that we are above all kind of personal interests or worldly gains. The spirit and motivation with which we are living, our thoughts and endevors all are centered around the interest of the country and welfare of the people. Haq Sahib, please don’t try to impose anything on Dalim as your son. He is much more matured than his age. With Gen. Zia’s words Abba became quite and never talked again. Well Dalim, I appreciate your straight talk to which you are used to. However, I shall request you to discuss with your other coulleagues about my prppossal and come to Dhaka to let me have your final decision. I am asking you to come to Dhaka for the simple reason to be on ground to analyze what kind of politics I am persuing before you convey your final decision. The Act one of the dramma has finished to night but the last Act would be played tommorrow night. Everyone was slightly disappointed but got the message and retired to their bed rooms. It was a hectic day so you need a good rest. Then he told Abba that he would not bother him to night so arrangement was made to take him to my residence.